Mining for lead, copper and iron ore have been an important part of Cumbria’s economy since the days of Elizabeth the First and copper is believed to have been worked at Coniston since Roman times. overshadowed by the more well established Cornish specimen trade. The most famous collector who helped to make ‘Cumberland’ specimens desirable to the fashionable elite was Byrce Wright, a native of Caldbeck village, whose labels are much sought after today. In recent years, Cumbria has suffered the same economic decline in metalliferous mining as other traditional mining areas of the British Isles, through exhaustion of the ore bodies and/or economic factors. There are working quarries in Cumbria still, but compared to those in neighbouring Weardale, contain little of mineralogical interest. 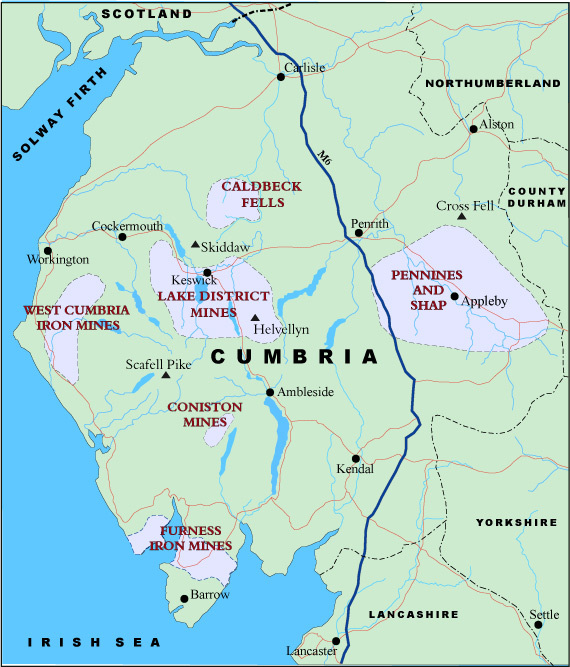 The modern administrative county of Cumbria covers the old counties of Cumberland, Westmoreland and the Furness district of Lancashire, locations commonly seen on many old mineral labels. The area has produced some of the most outstanding specimens found in the British Isles and for some species perhaps the best yet found, many museums around the world having superb examples from here, particularly, barite, calcite, hematite, pyromorphite, plumbogummite, campylite (var. of mimetite), linarite, caledonite, fluorite and examples of many rarer species. Nearly all these specimens have come from 4 mining fields; West Cumbria, the Caldbeck Fells, Keswick and, in the east, the Pennine escarpment. Surprisingly, given their occurrence in a relatively small geographically area, the mineralogy and species are very different, a result of the complex local geology and differing degrees of oxidisation of the ore bodies. Mining has taken place in other parts of the county, most notably around Coniston (copper), the Eden valley (gypsum) and Furness for iron but their mineralogical legacy is of lesser interest. Hodbarrow and Stank mine in Furness are perhaps the only exceptions to this with occasional specimens of excellent calcite and kidney ore to match those from West Cumbria. This has a permanent display of minerals including excellent specimens from the Caldbeck Fells, West Cumberland and Greenside mine. The Millennium gallery puts on regular displays of minerals from its extensive collection including a fabulous blue fluorite from Ullcoats mine. Check beforehand to establish if any mineral specimens are on public display. Two of the private mineral museums in the area have closed, - Florence Mining museum and Keswick Mining museum. Ian Tyler who ran Keswick museum will be continuing his mining walks. Threkeld museum is still open but now concentrates on quarrying and mining history and has a small show mine on the site.